Crisp air, pumpkin spice everything and cozy sweaters - it's that time of the year! What better way to celebrate the season than to create a handful of Fall cards with a token of gratitude. Let's take a closer look at the Oak Leaf stamp and steel die set and how we can create traditional and nontraditional greetings with the same set. This is our traditionally colored Fall card. The background was created with a wash of Fired Brick, Spiced Marmalade and Fossilized Amber Distress Oxide inks. The steel Oak Leaf die was used to cut an intricate white leaf for the center of the card. A vellum banner grounds the sentiment and a sprinkle of sequins adds movement to the card. I wrapped some twine around the card a few times to lend to the fall feel. This is the complete opposite of our traditional card. The bold colors are eclectic, bold and fun. Two intricate leaves were cut in hot pink and white and layered in the center of the card. To fill in the white leaf, bits of cardstock were used to back the design and give it a stained glass look. The design is very similar to the traditional card with the sprinkle of sequins and banner sentiment, yet it has such a different feel. And there you have it - two totally different looks with the same Oak Leaf stamp set. Color can make all the difference in the world! Sunny Studio New Release Blog Hop + Birthday Celebration Giveaway! 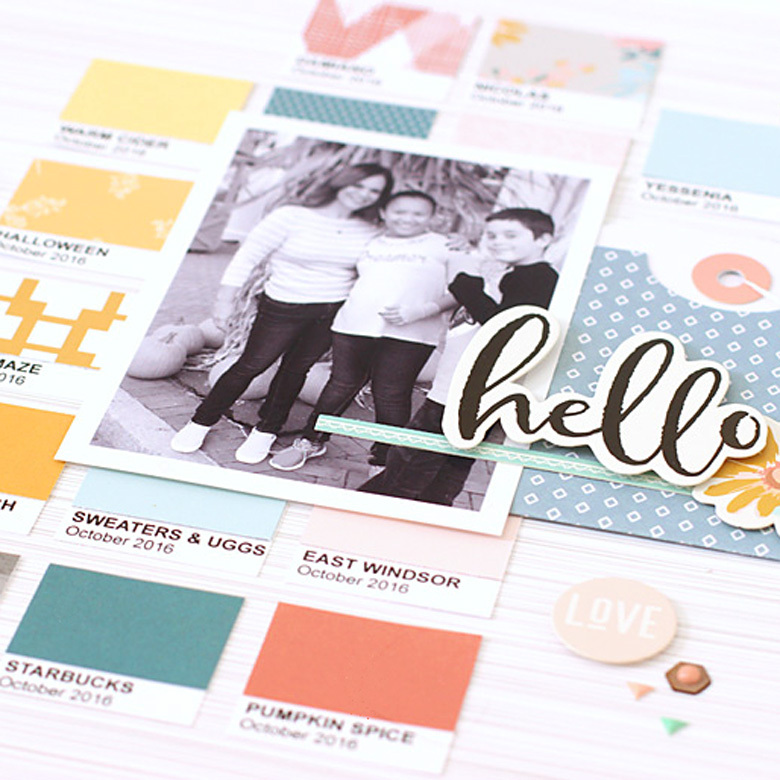 Hey there and welcome to the birthday celebration of one of my favorite stamp companies - Sunny Studio! I'm a huge fan of the whimsical feel of this company's style. Now in honor of today's celebration, let's take a look at one of the new holiday releases! The official release is on September 29th but in honor of their birthday, the new products will available as a pre-order HERE this morning! Be sure to use the code "CELEBRATE" through October 1st to receive 15% off your order. 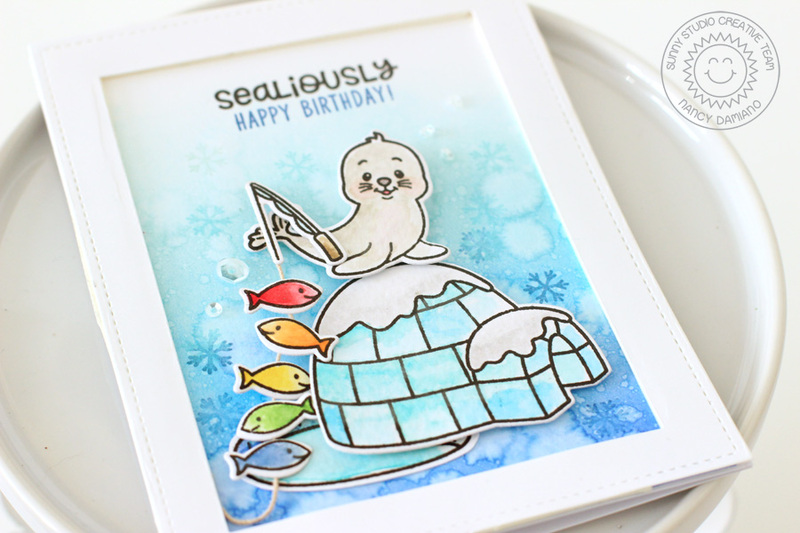 I used the new Polar Playmates Stamp and Steel Die Set to create this card of wintery goodness. There are sentiments included to make it a holiday, birthday or generic card. I love that! To create the card use watercolor paper and a wash of Distress Inks in Blueprint Sketch, Peacock Feathers, Broken China and Tumbled Glass. 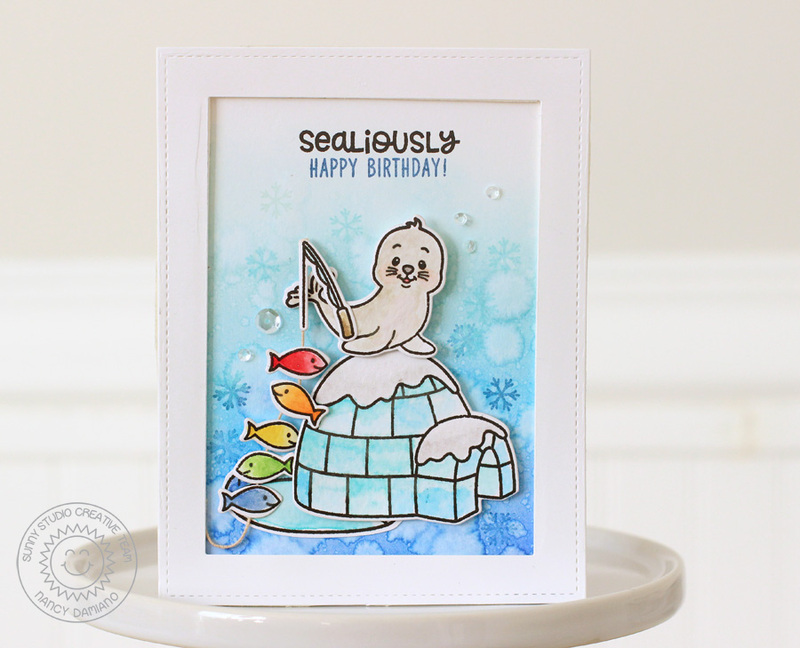 Add a layer of frosty snowflakes from the stamp set in pigment inks right over the watercolored background for a cool patterned background. All of the stamped images were watercolored with Distress Inks and layered to create a scene. The fish were glued to embroidery string for a fun, textured element. A brush of Wink of Stella over the white caps of the igloo and a sprinkle of sequins finishes of the card. I also have a $25 gift code for you today. I will chose a random winner from the comments. Tell me which of the new release sets is your favorite and you are entered! All winners will be announced on the Sunny Studio blog on Friday, September 29th. Good luck! Kay Miller - visit here next! I love the fall feel of this month's Felicity Jane kit, Heidi. The first thing that caught my eye was those beautiful colors in the solid cardstock sheets. I knew that I wanted to highlight them and put them to good use! Since I was thinking about color, the idea to create little paint chips came to mind. 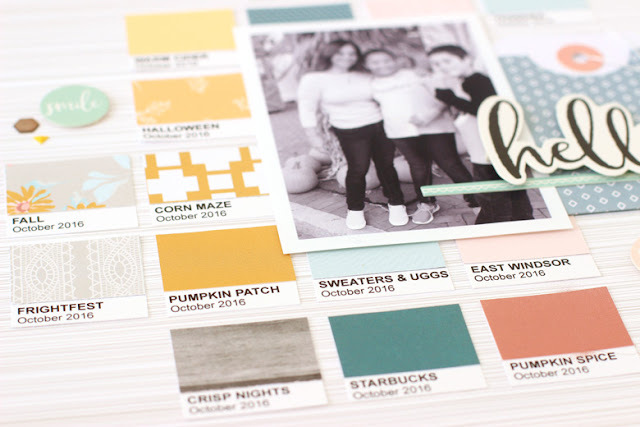 What better way to showcase color than to create a custom, pretty palette of fall hues. I created white boxes that are 1.5" wide by 1.35" tall, placing custom titles in the lower half. This personalized the story and embellishment. Using a very plain bolded Arial font for the title at the top is key in creating a nice clean look just like the Pantone color chips. I repeated the date at the bottom to keep the chips uniform. Gathering all the bits of color and spacing them to create a background layer for the focal photo to lay on was the key in this design. To place some weight just behind the photo, I used a tag and envelope to ground the title and add a bold pop of blue to the layout. The script yellow title is held in place by the aqua strip die cut and the pretty yellow flower. To add a bit of design flair, I added a tassel attached with embroidery floss to the tag. This gives this area a pop of movement and something fun! A sprinkle of circle die cuts (a contrasting shape), hexagon wood veneer and some left over puffy triangles completes the design. That scattering gives the boxy background so much needed movement. Contrasting shape is an easy way to achieve that. Custom paint chips can be used in so many ways. 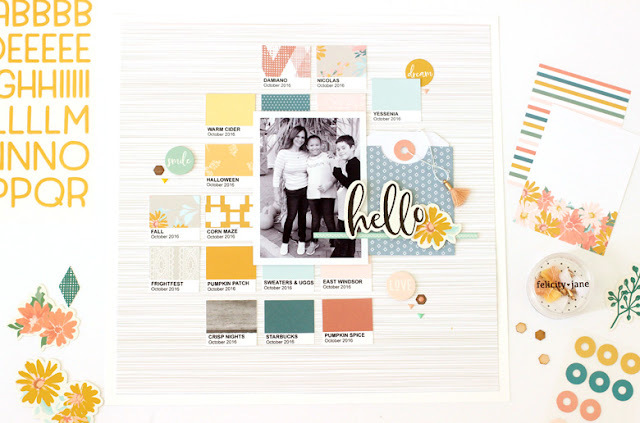 Think of the possibilities for birthday, Christmas and baby layout. 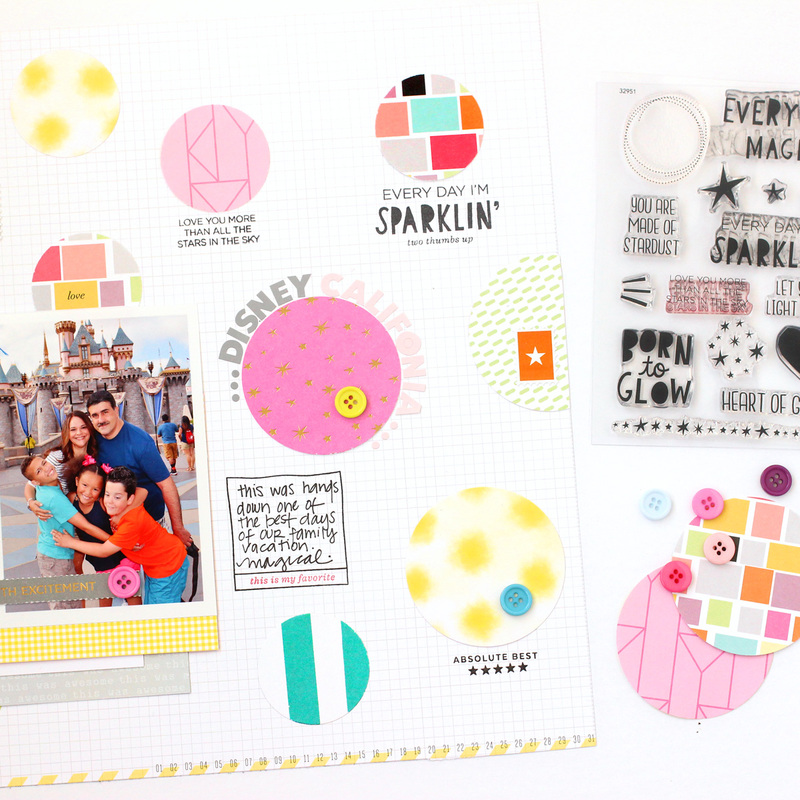 When you are looking for a clever way to put the kit solids to work - create a color chip! Hey there, welcome to the fourth day of the September Neat and Tangled release. The last stamp set up is called Merry Kisses with it's holiday charm and warmth. It's perfect for creating beautiful cards for the season. I will definitely be using these for some Christmas cards this year but I wanted to try something a little different with this set. I challenged myself to use the set to make a Fall card and this is what I came up with. 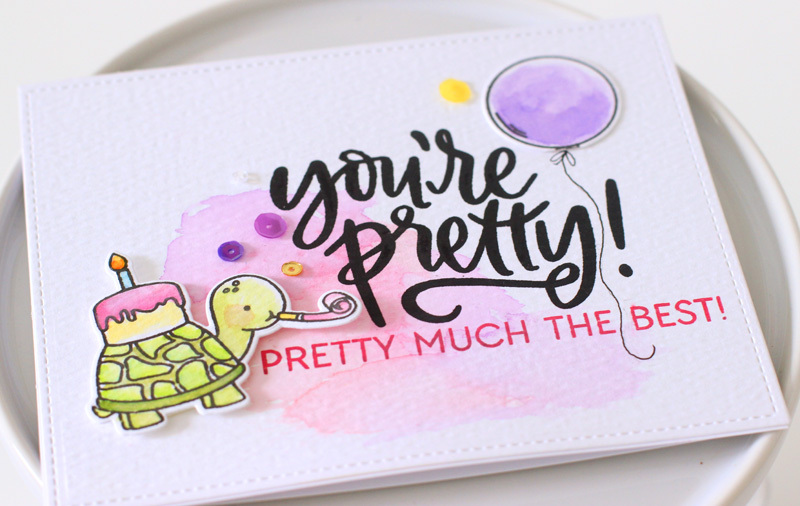 To create this card I used the Neat and Tangled Merry Kisses stamp set to create this fun watercolored card. The scene background of the card was was watercolored with a splash of Distress Oxide Ink in Fired Brick and Fossilized Amber. The leaf was cut using the white cardstock and the Oak Leaf Steel Die. This made a great place to ground the warm hugging wolves image which was colored with Distress Inks. Finally, a sprinkle of sequins was added across the design. Neat and Tangled will be giving away a Merry Kisses stamp set. To enter, leave a comment below to be entered. Tell me what's your favorite fall tradition is. Visit the Neat and Tangled blog on Friday for a list of winners. Good luck and thanks so much for stopping by! 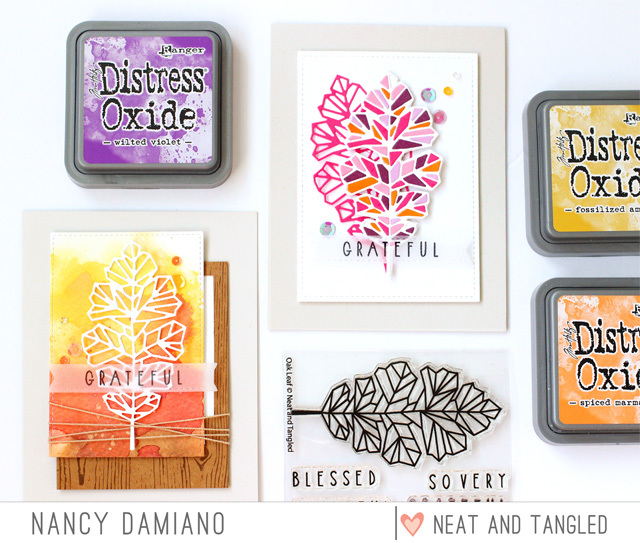 Hey there, welcome to the third day of the September Neat and Tangled release. The third stamp set up is called Landscape Textures and it's full of some beautiful patterns. It's perfect for making interesting backgrounds and combining those with ink washes. To create this card I used the Neat and Tangled Landscape Textures stamp set to create this fun watercolored card. The scene background of the card was stamped with the dots from the Landscape Textures set several times and embossed with white embossing powder. After drying it was watercolored with a splash of Distress Oxide Ink in Worn Lipstick, Spiced Marmalade and Wilted Violet. This really made that dot pattern pop! The sentiment was stamped from the You're Pretty stamp set and embossed in white to match the dots. Finally, a sprinkle of sequins was added across the design. 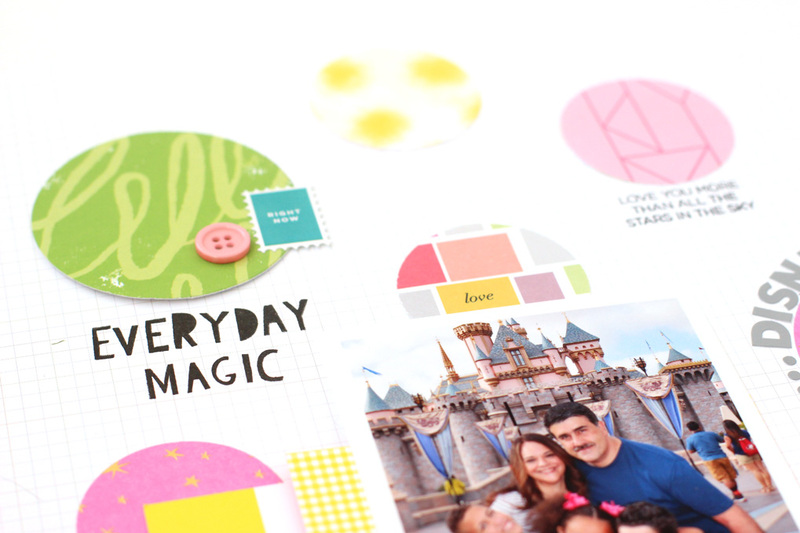 Neat and Tangled will be giving away a Landscape Textures stamp set. To enter, leave a comment below to be entered. Tell me what's your favorite pattern is from the set. Visit the Neat and Tangled blog on Friday for a list of winners. Good luck and thanks so much for stopping by! Welcome to Fall! I can't believe it's time for pumpkin spice everything and the season of gratitude. It's one of my favorite times of the year to create homemade goodness. Let's start by combining beautifully layered Pretty Pumpkins and warm Autumn Greeting from these seasonal stamp sets. 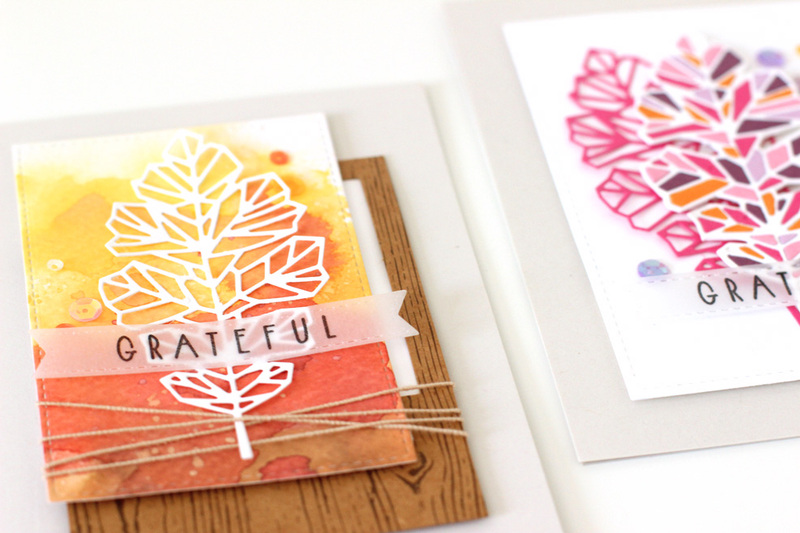 To create card, I used Distress Ink in Spiced Marmalade to create a soft, ink blended background. Next, the pumpkin was stamped several times with pigment ink in several shades of orange. The stem and leaves were stamped in a bright grass green for contrast. Last, the sentiment was centered and stamped with Versafine Ink in Black Onyx. A glitter enamel dot in the center of the leaf completes this simple, warm design. 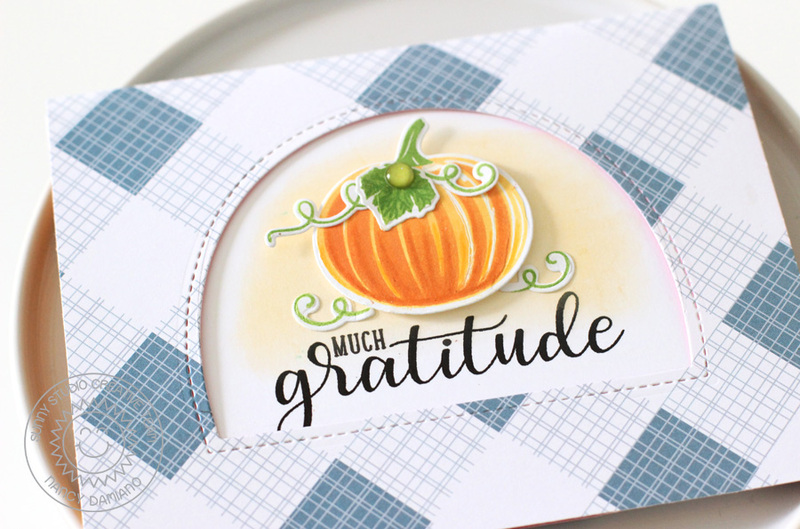 Take a look at the Pretty Pumpkins stamp set for all of your warm Thanksgiving wishes. 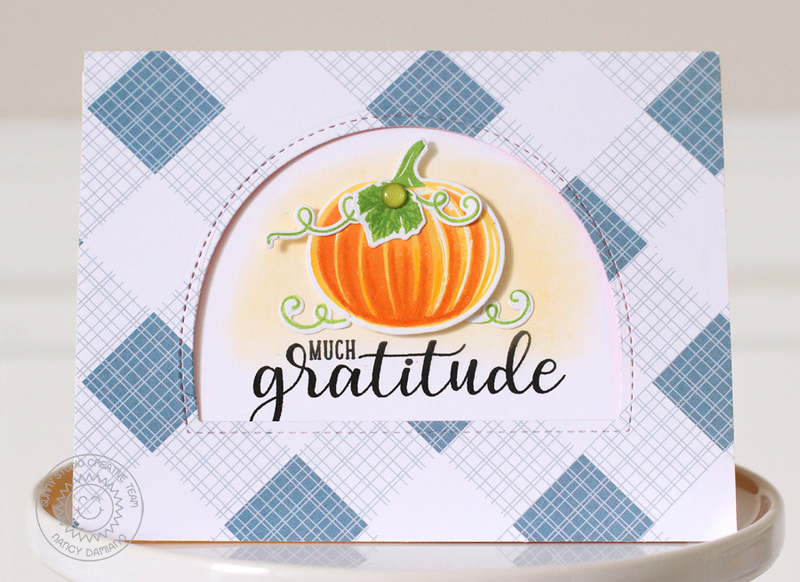 The layered stamps are fun and easy to use, plus they create the most beautifully shaded pumpkins. The Autumn Greeting stamp set is the perfect compliment for this pumpkin patch! Hey there, welcome to the first day of the September Neat and Tangled release. 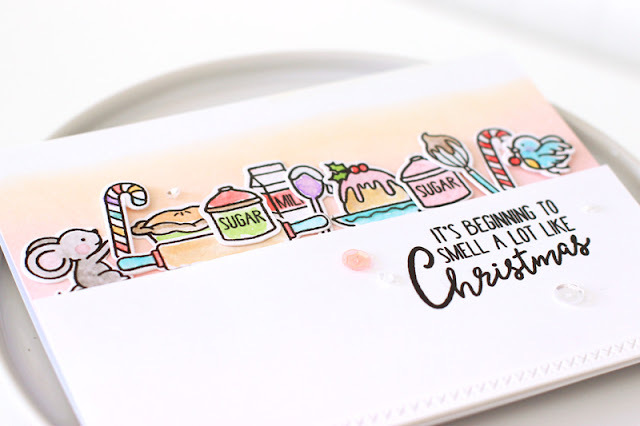 The second stamp set up is called Holiday Baking and it's chock full of heartwarming Christmas images. 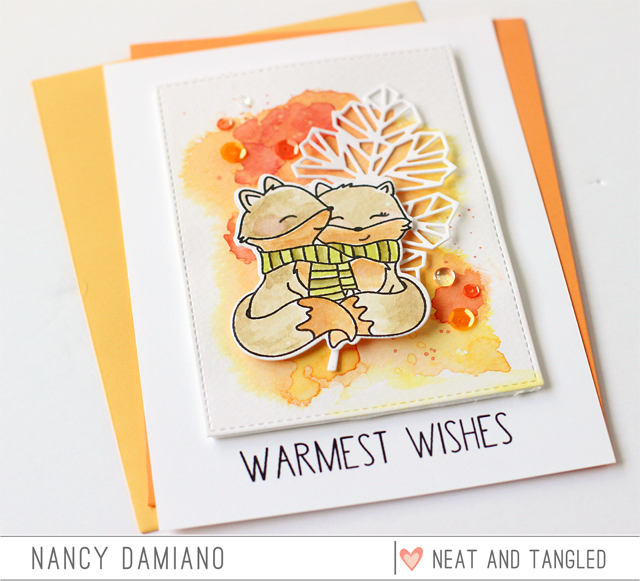 It's perfect for making holiday cards with an extra dose of charm and cozy. 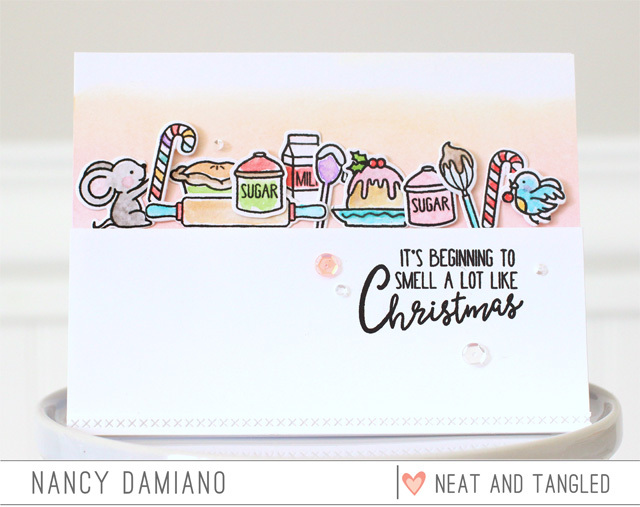 To create this card I used the Neat and Tangled Holiday Baking stamp set to create this fun watercolored card. The scene background of the card was watercolored with a splash of Distress Oxide Ink in Worn Lipstick and Spiced Marmalade. Each of the stamped icons were watercolored with Distress Inks. The images were layered across the card to create a scene of homemade goodness. The sentiment was stamped with Versafine ink in black and a sprinkle of sequins from Neat and Tangled finish off the card. 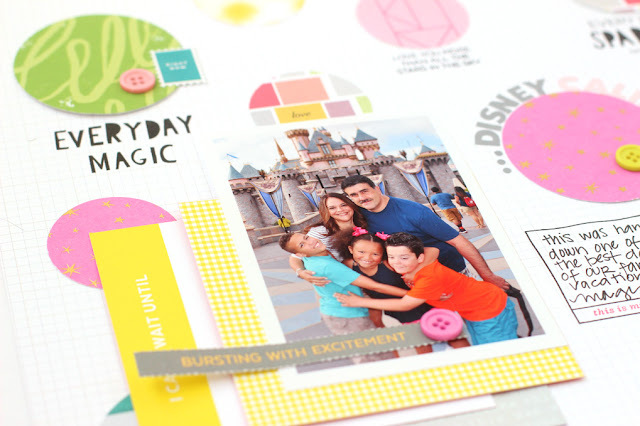 Neat and Tangled will be giving away a Holiday Baking stamp set. To enter, leave a comment below to be entered. Tell me what's your favorite thing to bake (or buy) for the holidays. Visit the Neat and Tangled blog on Friday for a list of winners. Good luck and thanks so much for stopping by! Hey there, welcome to the first day of the September Neat and Tangled release. The first stamp set up is called You're Pretty and it really is. I love all of the different sentiment possibilities included in this set. The beautiful, bold script is perfect for so many different types of cards. To create this card I used the Neat and Tangled You're Pretty and Wild Ones stamp set to create this fun birthday card. The base of the card was watercolored with a splash of Distress Oxide Ink in Worn Lipstick and Wilted Violet. I kept it very light by using quite a bit of water. The sentiment was stamped with Versafine ink in black. 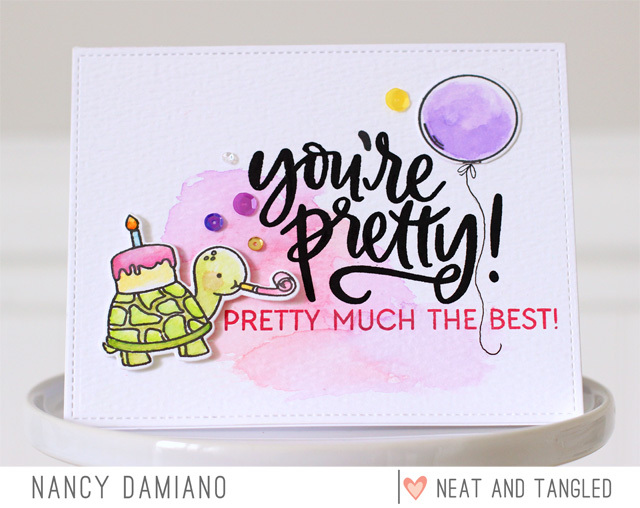 The cute turtle and balloon were watercolored with Distress Inks. A sprinkle of the new sequin mix from Neat and Tangled finish off the card. ard, some with a bit of foam tape for lift. Neat and Tangled will be giving away a You're Pretty stamp set. To enter, leave a comment below to be entered. Tell me what's your favorite watercolor brand is. Visit the Neat and Tangled blog on Friday for a list of winners. Good luck and thanks for stopping by!